Our animals mean so much to us here at Tom Duffy's Circus - our animals are extremely well kept and looked after by a specialised team of animal carers. Our animal carers know each animal individually and this ensures our animals are kept in top condition. Our animal carers live, work and care for our animals 24 hours a day 7 days a week. Our animals are fed, watered and groomed numerous times each day while great care is taken to ensure that each individual animal is in top condition. Our animal trainers teach our animals routines that are within their natural ability and showcase their natural beauty, although it may look complicated all our animals do is walk, run, jump and sit up. We take great pride in our animals and the level of care we provide to them. At most performances we give our audiences the opportunity to visit the animals 'backstage' where our animals live, eat and sleep. 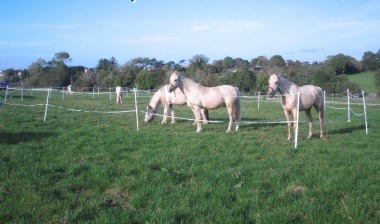 This gives the public an opportunity to see our stable area where all our animals live. Our animals are great performers, their routines are tailored to each animal’s natural abilities and individual preferences which we observe during their playtime. Reinforced through a system of reward and repetition, these abilities and behaviors are linked together on cue which ultimately becomes the routine that you see.